Matteo Rabottini (Farnese Vini) took a hard-fought win from an early escape in stage 15 of the 2012 Giro d’Italia on Sunday after being at the front of the race all day. A late charge to the line by Joaquin Rodriguez (Katusha) couldn’t stop Rabottini taking the victory atop Piani dei Resinelli. Rodriguez placed second, with Alberto Losada (Katusha) in third at 23 seconds. Rodriguez rode himself back into the overall leader’s pink jersey, with previous leader Ryder Hesjedal (Garmin-Barracuda) finishing in 12th spot, 39 seconds down on Rabottini/Rodriguez. Hesjedal now sits in second place overall, 30 seconds adrift of the Spaniard. Ivan Basso (Liquigas-Cannondale) is third at one minute and 22 seconds. Sergio Henao (Sky) placed fourth on the stage to relieve Colombian compatriot and team-mate Rigoberto Uran of the white jersey of best young rider. Escape duo Rabottini and Guillaume Bonnafond (Ag2r) broke free from the peloton at around 20 kilometres, and pretty quickly built up a lead of nine minutes in rain-soaked conditions. Rabottini was the stronger of the two, and struck out alone on the first and highest rated of the day’s four categorised climbs, the cat one Valcava. Behind, Amets Txurruka (Euskaltel-Euskadi) and Emanuele Sella (Androni Giocattoli) set out on the climb to chase the leaders. 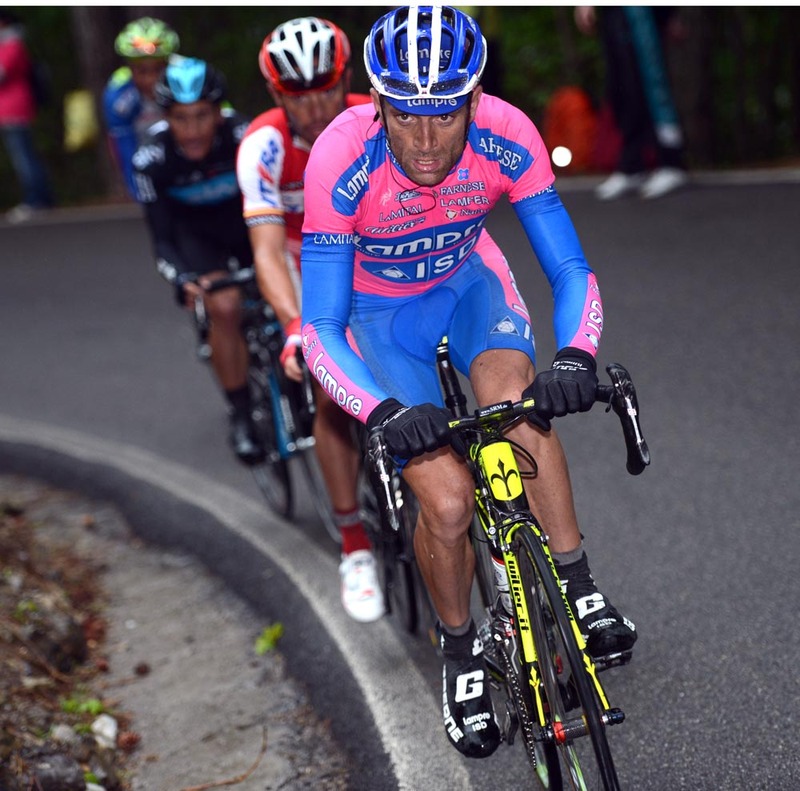 They were joined by a larger group of riders, and later Damiano Cunego (Lampre-ISD) bridged the gap. Rabottini forged ahead, building up his lead over Hesjedal to near 10 minutes. The eleven chasers also worked hard to distance Hesjedal’s group putting 2004 Giro champion Cunego into the virtual race lead, and causing an element of panic among the overall contenders. Liquigas-Cannondale and Garmin-Barracuda took control of the front of the peloton to try and whittle away the advantage of Cunego and the riders ahead. Rabottini looked to be paying for his day-long effort in the final 25 kilometres, as the Cunego-led chasers moved ever closer. The Italian slid out on a wet corner, crashing to the ground and struggled to get himself out from under his bike. Scuffed and dirty, he remounted to continue the charge. Astana took to the front of the reduced leader’s group at the foot on the final climb, with Hesjedal in close attendance. At that point, Cunego was riding with just four others in the chase group, which susequented broke up when Stefano Pirazzi (Colnago-CSF Inox) accelerated away. 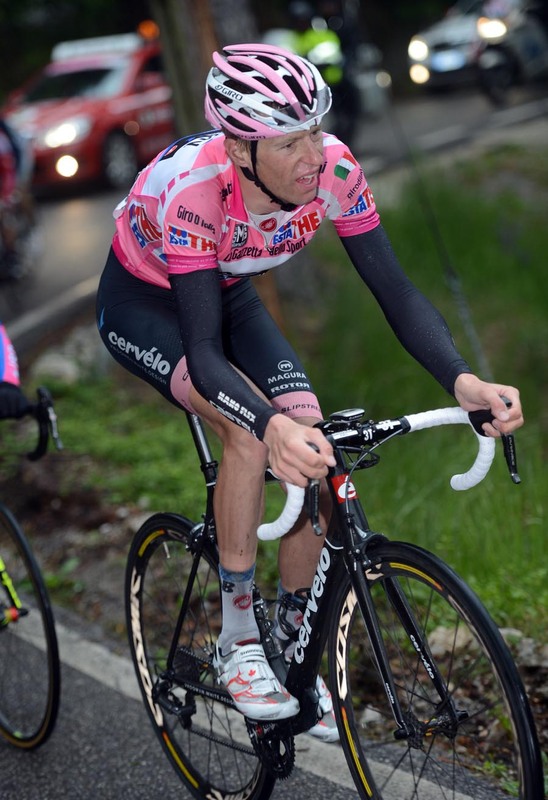 Cunego slipped backwards and was caught the Hesjedal group just as Lampre-ISD team-mate Michele Scarponi attacked. Rodriguez followed and then passed Scarponi, passed the remnants of the chase group including Pirazzi and then straight past Rabottini in the final 500 metres. Rabottini somehow found the energy to catch up with Rodriguez, overtake him and clinch the win. 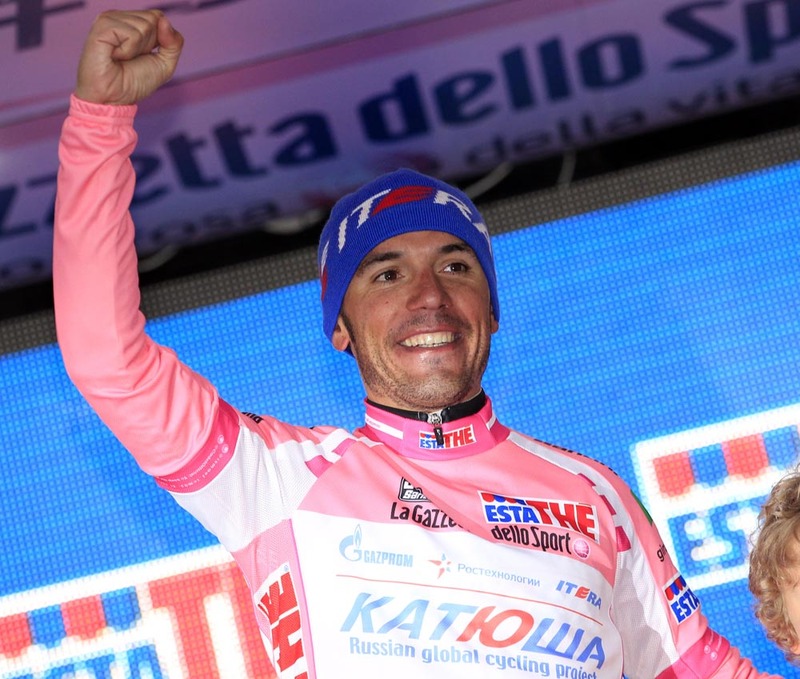 Rodriguez’s compensation for missing out on the stage win was another pink jersey. The day saw several riders call it quits, either before or during the stage. Frank Schleck (RadioShack-Nissan) abandoned, citing problems with a shoulder injury from a crash earlier in the race. He was a late addition to the Giro start list after team-mate Jakob Fuglsang was withdrawn from the start list due to a knee injury. 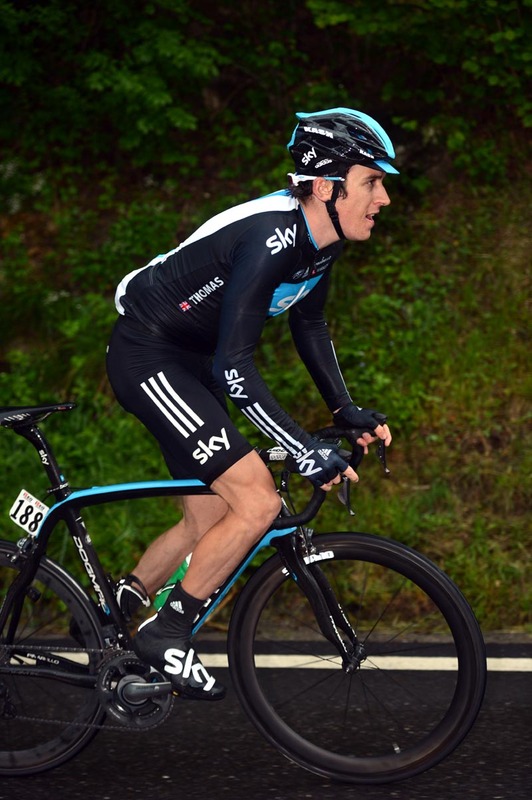 Another rider out of the race is British veteran Jeremy Hunt (Sky). Hunt returns home for the birth of his baby. Mark Cavendish (Sky) strengthened his lead in the points classification by sprinting for third in the day’s intermediate sprint – before Valcava – behind the two escapees. Cavendish finished in the 60-rider grupetto that came in 34-48 down on Rabottini. After 12 days of back-to-back racing the riders get to have a much needed day off Monday, the second rest day of the race. The race is still pretty open, and a lot can change in the final week with three more high mountain stages and a final time trial showdown in Milan on Sunday, May 27, to sort out the podium positions.